You can link your Squirrel POS with 7shifts to provide accurate sales forecasting when building schedules. This allows you to stay on budget and schedule within your labor target percentage. 7shifts will also show you in real-time your actual sales compared to your projected sales. To get started, you will need to contact one of our integration specialists by email support@7shifts.com or calling us at 1-888-979-5877 ext 1. They will help you with the installation and integration process. 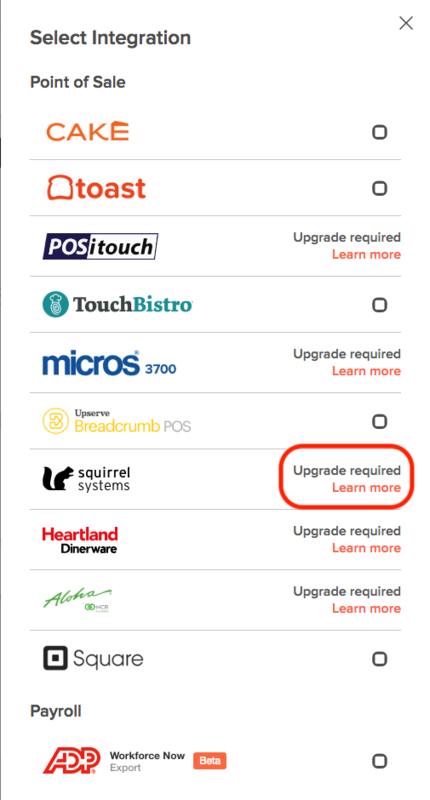 For Squirrel POS integration you will need to upgrade your account to the 'Gourmet' plan. You can link your Squirrel POS with 7shifts to provide accurate sales forecasting when building schedules. This allows for more accurate scheduling if you're wanting to stay on budget and within your labor target percentage. 7shifts will also show you in real-time what your actual sales are and alert you when you're making shift changes. We integrate with Squirrel actual labor. This means that when your staff punch into the Squirrel POS for all of their shifts, we can then pull that actual labor data into 7shifts. 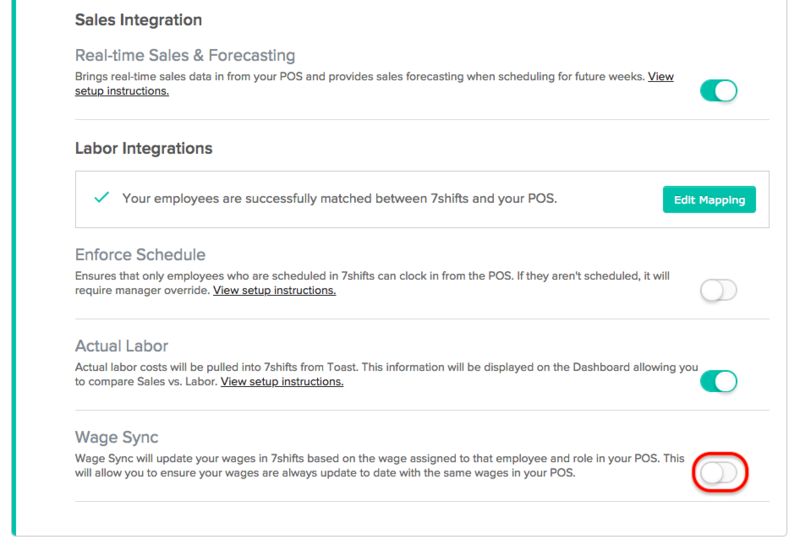 Once enabled, your actual labor costs will be displayed on the Dashboard allowing you to compare Sales vs. Labor. It's very important that all of your employees have their wages entered correctly in both 7shifts and your Squirrel POS. This ensures that your scheduled labor and actual labor are calculated with the same wages. Hover over your profile picture > Company Settings > Add-ons > Third Party > 'Squirrel POS'. Click 'Map Roles and Employees' to map your Roles and Employees between your POS and 7shifts. First, you'll want to map your specific Roles between your POS and 7shifts to easily assign Roles when adding new employees from your POS. If 7shifts was not able to auto-map the specific Roles, you'll need to either create the Role within 7shifts or your POS, or map it to another existing Role. 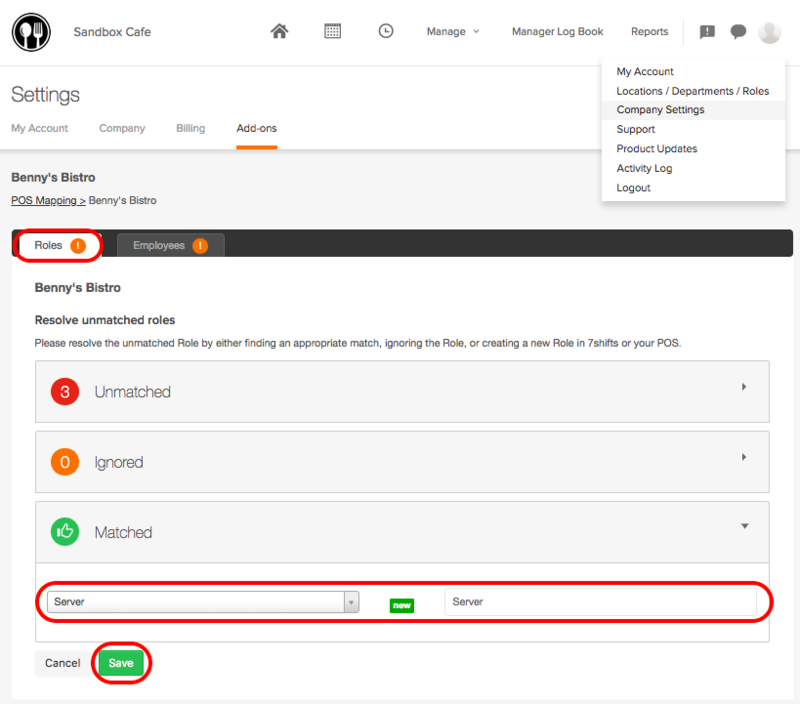 Next, click the 'Employees' tab to review the employee mapping. Please review all matched employees before clicking 'Save'. If an incorrect match was made, you can always correct the mistake by clicking 'Unmatch'. The employee will now be listed under 'Unmatched' and you can assign them correctly from there. After clicking 'Save', it can take up to 3 hours to finish syncing. Hover over your profile picture > Company Settings > Add-ons > Third Party > Squirrel.